Work more safely by lighting your work zone with this economical and powerful work light. 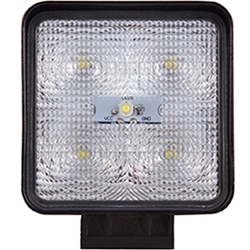 This convenient light provides both flood and spot lighting using five 3 Watt LED lights giving off 1200 lumens. This work light easily switches between a flood mode with a 60 degree viewing angle and a spot mode with a 15 degree center spot viewing angle. With a sealed, water-tight lens, you can see your work in any weather. Please allow for an additional 1 - 2 business day processing time on this item.